Turning off the Interbalnearia Route at km 126, you rise towards Punta Ballena, coming upon a beautiful scenario of hills, beaches, forest and sea. The road reaches a lookout at that point. 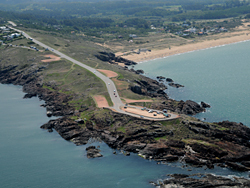 A few metres beyond (there is a sign: Ruta Panoramica), you can access Punta Ballena via a sinuous road some 2.5 km long, which ends in an esplanade on the sea. Building this road took two years of hard labour removing rocks, but it was worth it: towards the West, you can see the hills of Piriápolis and towards the East, the whole peninsula. It is the only vantage point from where you can see the two islands: Gorriti - on Playa Mansa - and Lobos on the Brava. Towards the left, some 500 metres before the rocky end of Punta Ballena you will find Casapueblo, the immortal work of Uruguayan artist Carlos Páez Vilaró.